This is a real tasty fish curry….It is prepared with the mustard-poppy seed paste….This dish is very easy to cook and less time consuming. 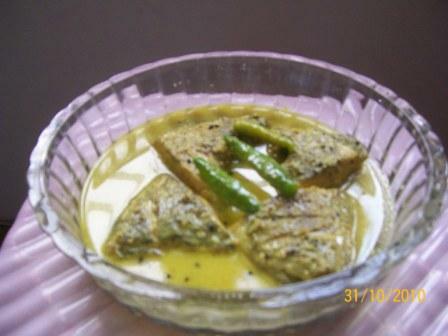 Marinate fish with salt and turmeric powder and fry in oil till it becomes a little crispy. Now take 2 tbsp oil in the frying and add black jeera. Now add the mustard-poppy seed paste and the green chilies. Cook by continuously stirring for sometime. Now add turmeric powder and salt. Add measured amount of water and mix well. Add the fried fishes and cook till the gravy becomes a bit thick. If wish, garnish with chopped coriander leaves.